Shield: Reduces damage by 1. When struck, 1 to 3 charges are converted to shale stone spikes. 20 charges. Shield: Reduces damage by 1. When struck, 1 to 2 charges are converted to feldspar spikes. 20 charges. "Today is a day to remain firmly grounded"
"Some people might think your starting to crack under pressure, but you're solid underneath. 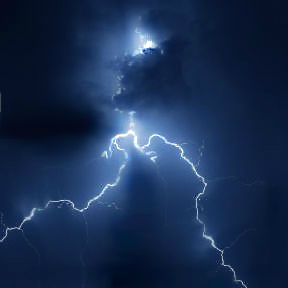 Bide your time and then strike hard when the moment is right." The spikes created by these shields accumulate into stacks. The stacks can be used (sacrificed all at once) to deal damage to a chosen target equal to the stack size. 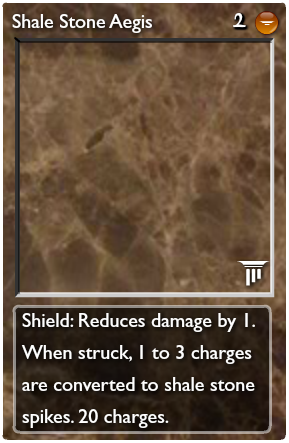 Hitting this shield with destruction effects (deflagrate, etc.) only removes 1 charge. The same goes for the spike stacks it creates. Playing a second shale stone shield while one is already active will add its charge (rather than reseting it to 20). 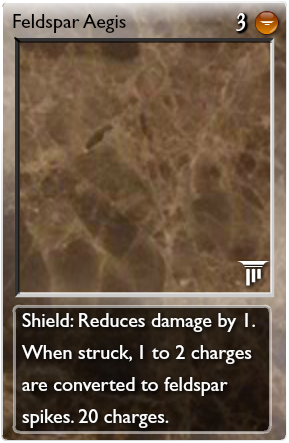 Like other shields, the secondary ability only triggers when damage actually goes through the shield. E.g. 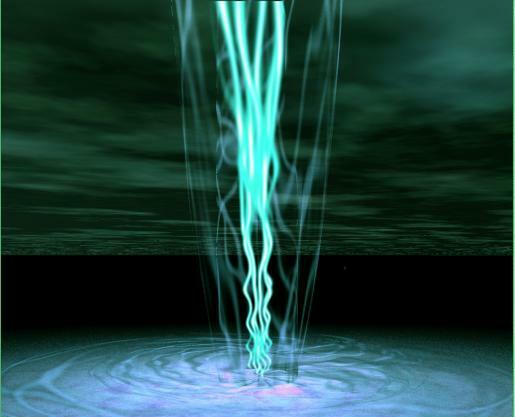 malignant cells would not trigger spike production. 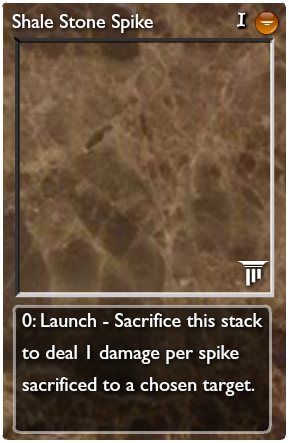 0: Launch - Sacrifice this stack to deal 1 damage per spike sacrificed to a chosen target. 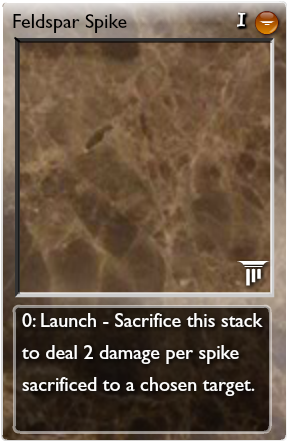 0: Launch - Sacrifice this stack to deal 2 damage per spike sacrificed to a chosen target. Shield: Reduces damage by 1. When struck, 1 to 3 charges are converted to feldspar spikes. 20 charges. Doubling the damage for no cost increase sounds a little too... Powerful for me. I'd increase the cost. Bumped cost by 1. Is that reasonable or would a bit more be better? I think the upped should only have a chance of 1-2 spikes to compensate for the double damage. Otherwise is an interesting idea. That seems reasonable to me. Was playing around a lot with that balance before posting it. Figured it was just easier to keep the amount of changes to a minimum, but the power may need a slight nerf on the upped. Hey you! Join a PvP event! Solar Buckler still produces quanta for creatures with 1 ATK, I think it makes more sense that this shield should do the same. I think giving it Bonewall-like PC resistance makes it a bit OP. Since the stacks presumably also act similarly, it would basically be unstoppable. In the long run one Feldspar Aegis = 2 UG. It's slower, but can't realistically be destroyed. Like reading? Here's a story inspired by Elements, City of Alchemy. I could go either way on it honestly. I figured it made sense the way I listed it because the idea is that pieces of the shield are getting broken off during attacks. I.e. if a creature doesn't hit it hard enough, then the piece won't break off. The UG analogue is intentional. Speed is a big difference though. Also, the opponent has some control over how quickly they race to their own fate. That isn't the case with UG. I think that should be enough to keep the balance, although playtesting will probably be the only way to know for sure.